A little while back, we got started with using keywords to add tags to our images. A lot of my readers wrote in to thank me and shared that adding those keywords makes their images a lot more searchable. However, it wasn’t all good feedback. You see, although keywords are useful, they can be really time consuming to apply! Today, we’re looking at using keyword sets, my favorite trick to cut down on keyword work. In short, keyword sets are groups of keywords that we can create and keep handy. 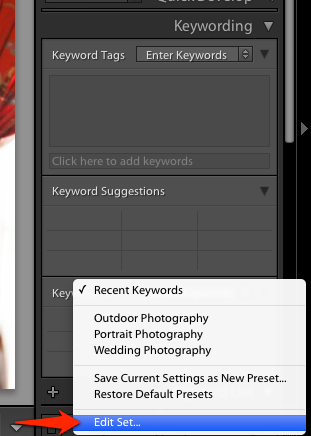 Instead of adding “wedding” to every image, and then “June” to every image, we can put both keywords in a keyword set and put the set at our fingertips. When we build keyword sets, we want to keep them fairly “high level.” That means keeping the keywords we use general. We would want to add “wedding” as a keyword, but probably not “flowers” since that won’t apply to every image. When it comes to keywording, we are going to be doing all of our work in the Library module. This is where we handle the data that’s tacked on to images, and keywords are a perfect example. 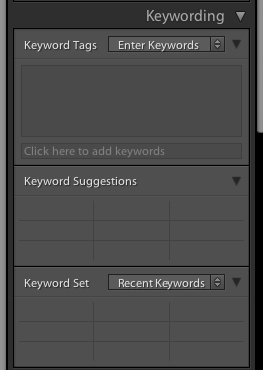 To build a keyword set, first find the keyword panel on the right side of Lightroom’s Library module. You’ll find the keywording panel on the right side of the Library module. Click the arrows to the right of “Recent Keywords” in this screenshot to get started with building a set. Keywords are essential for building the data we attach to images, but take some time to apply. With keyword sets, we alleviate some of the pain and win our time back by keeping the common keywords at our fingertips. Are you using keyword sets yet? Let me know how you’re applying your keywords. Sharpening is a part of the digital workflow that stumps many photographers. It can be easy to apply, but difficult to perfect the application of sharpening. 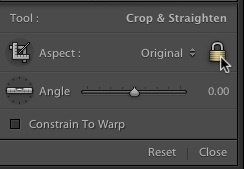 Luckily, Lightroom has a really powerful and easy to use sharpening panel. Let’s take it on today! Too many photographers will just crank the sharpening all the way up on a blurry photo, and wind up with a horrible finished product. Don’t do it! When we adjust sharpness, adjusting the amount is always my starting point. The amount scale runs from 0 to 150. It varies from photo to photo, but I’ll typically drag it up to a midlevel number like 50-60 on the slider. One thing that you’ll notice about the amount slider is that the far right side of the slider is red for a small portion. This is a warning area that cautions you against cranking your sharpening so high. More sharpening causes our images to go ugly and funky, and those high numbers should be used with caution. Typically, I leave this set to the default 1.0 pixel setting, Increasing it will increase our sharpening effects. Generally, when I do sharpening, I keep it simple: I’ll increase the amount slider for most of my images to around 25-30 on the amount slider and then leave the rest untouched. Easy enough, right? Images that could stand to have their detail emphasized more might receive a little more adjustment on the other sliders. Try and work at 100% when working with sharpening. This means using the navigator to zoom in and work on the It’s hard to measure the impact of sharpening when you are zoomed all the way out, and it’s easy to apply too much. When you use sharpening, the biggest point of advice that I want to offer up is to tread lightly. Many beginners, myself included long ago, have the habit of cranking the sharpening all the way up and creating some nasty looking images. Apply it sparingly and it can bring out the detail of our subject, but it can also be way overdone rather quickly. With that said, I encourage you to experiment with sharpening to enhance the fine details of your photo! Do you ever face a tough decision about which image to keep? Sometimes it’s hard to pick that “best” image out of a few. Lightroom offers a feature that allows us to place two images side-by-side and determine which one we prefer. This is called compare view, and it’s a great way to two-up images and make the choice easier. Compare view takes place in the Library module. To enter Compare view, press the the letter C on your keyboard, or press the compare view button just below the image workspace. You can press “C” on your keyboard to enter compare view, or press the button just below the image workspace. After you start up compare view, you may be wondering how to change the two images that are shown in the comparison grid. Lightroom lets us pick any two images to compare, even if they are completely unalike. Entering compare view chooses the image was already selected, plus the image that is directly after it. 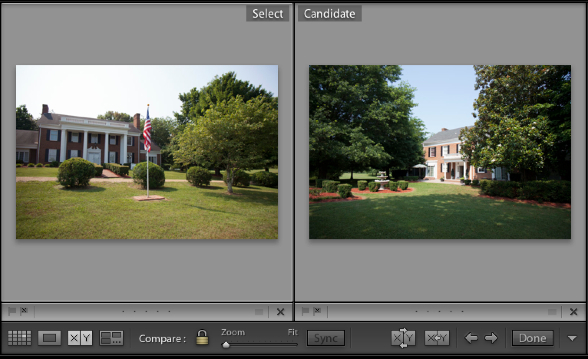 Lightroom’s Compare view always shows two images, which it calls Select and Candidate. 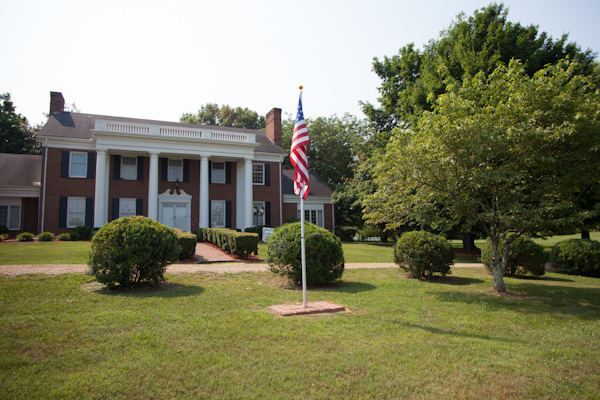 The select image is on the left and the candidate image is on the right. I always think of the Select image as my favorite, and the Candidate as the image that could possibly replace it. Clicking on any image on the filmstrip chooses it as the Select image. 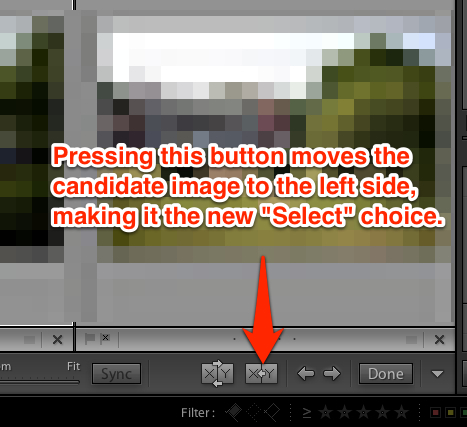 You can change the Candidate image by using the keyboard arrows, left and right. In this case, I’m picking my favorite image of the wedding venue. I clicked the first in the series to choose it as my select, and then used the keyboard arrows to continue scrolling through the other selections. Putting them side by side turns this into an easy visual decision. After you find one that you like better, press the button in the screenshot below to name a new “Select” image. Clicking the button illustrated above names a new “select” image for the left side of the image workspace. You can repeat this process as many times as you wish, cycling through selections and candidates until you come to a decision. One more tip: when you’re showing two images side by side, you probably want to see the two images as large as possible. To increase the size of the previews, hiding the panel on the left is a great way to do so. Press the arrow to the far left of Lightroom to hide the left side menu. You can always click the arrow to bring that panel back. Before hiding the panel, the images may be a bit too small to truly judge your favorite. After hiding the left panel, the view of the images is much greater as they take up the entire area. Compare view is a nice tool for selecting the best image out of a set. When you’re looking to make those tough decisions between two great images, consider using compare view to do so. Are you using compare view to select your best image? Leave a comment if you are using compare view or plan to start. The Library module holds the power to explore and manage our massive image libraries. Today we’re taking a look at how to browse our images with all the power that the module has to offer. I want to go spend today going over five essential parts and methods to navigating images in the Library module. This walkthrough assumes of course that you already have some images loaded into the catalog. If that’s not the case, you’ll want to check out this article. 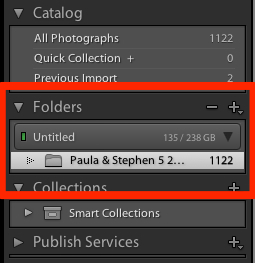 Lightroom allows us to browse images and filter them down by folder, just as our computers do as we explore the folders. The folder browser lets us explore images in the folders just as our computer’s file explorer does. 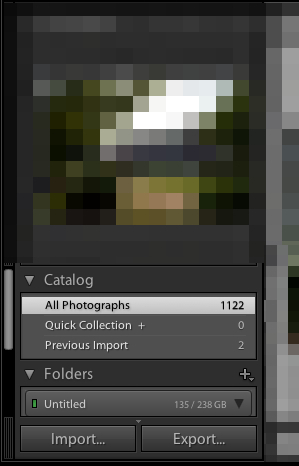 A part of Lightroom’s Library module that is important but doesn’t quite warrant its own post is the Catalog panel. This view allows us to switch between three different image selections: all images in the catalog, images in our current quick collection (which we’ll talk about soon), and the images we added with our last import. Lightroom has four ways of navigating your images that we talked about recently. These views are grid, loupe, compare, and survey. Check out this post to learn more about these four views and how we can use them. Grid view is one of the many ways of exploring our images in Lightroom’s Library module. The four views let us browse the images differently. Collections are yet another way that we can section off certain types of images. Creating a collection is a grouping of images that are lumped together. 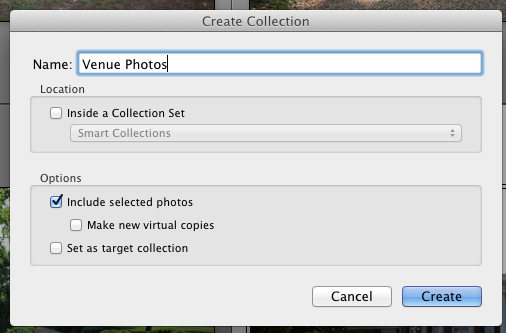 Go ahead and give your collection a name – I chose Venue Photos in this case. I usually leave all of the other options at default. Okay, so now we’ve got a collection! You’ll see that because we left the “Include selected photos” box checked, that two images are already in the collection. Your collection will pop up on the left side in the Collections pane. You can press the minus button to delete that collection. To add images to the collection, we can simply drag and drop images into that collection. Do I use collections? Sometimes. I wil use them typically when I’m delivering images for a special purpose. I might put together a collection for “Angie’s Corner Florist” or a collection for a particular family member. For me, this use of collections really boosts my workflow and lets those images live in a sandbox separate from all the rest. What’s the best way? The good and bad news is that there’s no right way to do things. Design a system that fits what you want to do. I spent so much time searching for the “right” way to do things that I was crippled by planning. How about you? Are you using collections or will you now that you know about them? Feel free to leave a comment to let me know how you feel. Cropping is so important because it can really improve our composition, and we all know about the importance of composition. One of these days, I’ll fill your head with composition ideas, but this is the 10 Minute Guide. 😀 That’s right, in about 10 minutes, we’ll make sure that you can get started with good cropping in Lightroom. 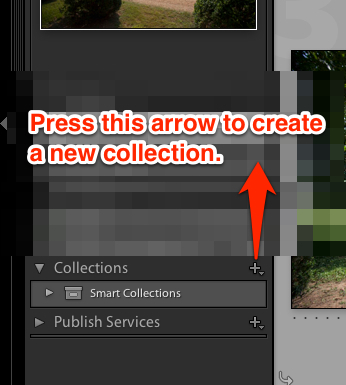 Someday, we’ll take a little closer look at some of the advanced ways to crop photos in Lightroom. But today, we’re taking a look at how to get started with cropping photos in Lightroom in a quick way. Okay, to get started, let’s make sure that you’re in the Develop module. You can click Develop on the list of modules (upper right hand corner of Lightroom) to enter it, or press D to enter it as well. Entering the Develop module lets us get started with cropping. Next, go ahead and pick out the image that you want to work with. 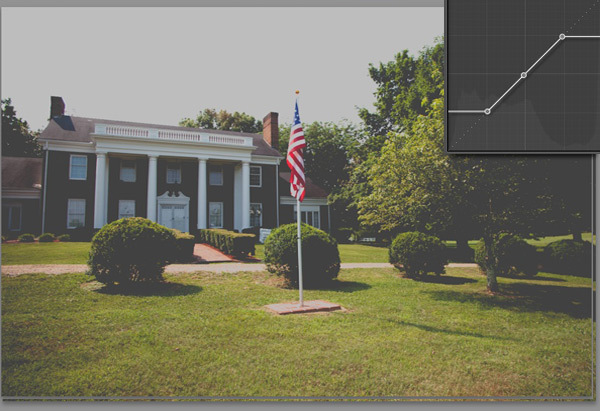 To get started with cropping, Press R on the keyboard, or press the crop button (far left) just under the histogram. Now, we’re ready to get started. 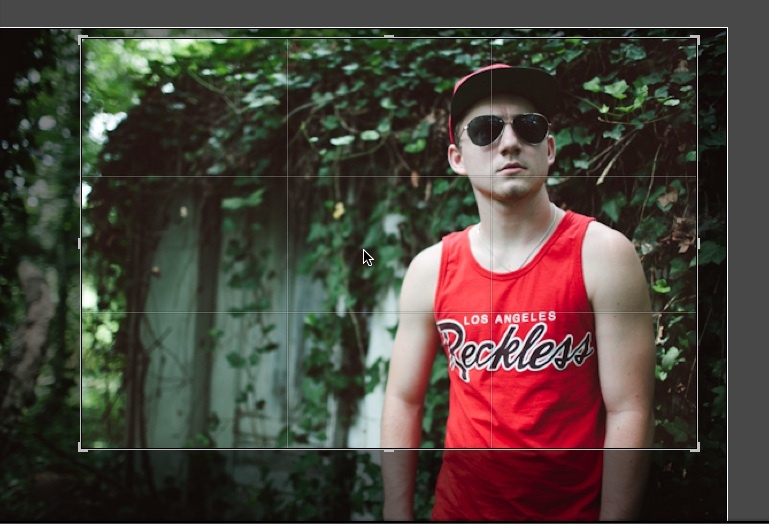 You’ll see that a grid has appeared on top of your images, and this is the basis for all cropping. Clicking the padlock locks the aspect ratio. 1) Grab a control handle of the photo. These are the thick lines that are at the corners and in the middle at top and bottom. You’ll see your cursor change, and dragging makes the rectangle smaller in area. 2) After you’ve made a smaller box, just drag the box to the area that you want to keep. After making a smaller box, I just drag the new smaller area to the “keeper” area”. Anything in darker gray is going to be cropped out. After you’ve done that, just press R on the keyboard again to leave crop mode and you’ll find your new crop! Another method is to just draw the rectangle over the area of the photo you want to crop to by clicking and dragging the box. If you want to “start from scratch” with the crop, that’s the best way of doing it. So there you have it – you’ve got a really quick and easy crop method! I can do most crops in under 10 seconds after mastering the tool. Should I buy Adobe Lightroom? This post is aimed at users who have never used Adobe Photoshop Lightroom. 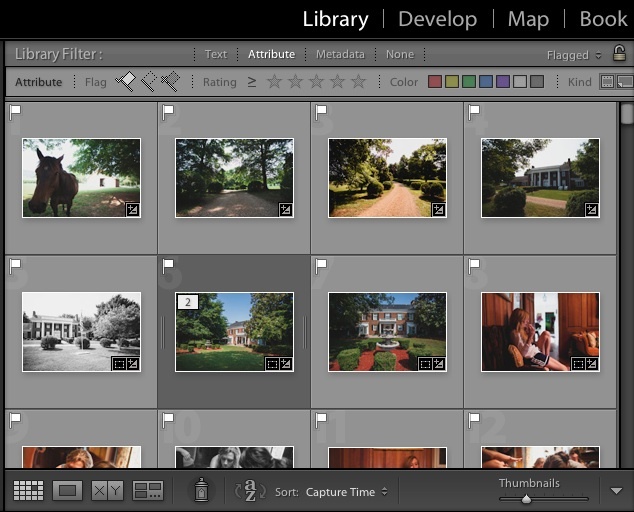 If you’re wondering if you should upgrade from Lightroom 3, check out this post. If you’ve taken notice of this site’s name, you can probably get a good idea of what my answer to the question is. But my path to using Lightroom might surprise you. Given the name of this site, you probably already know my answer. The problem wasn’t the program. The problem was how I used it. Attempting to jump into Lightroom and bite it off all at once is not going to end well. Instead, approach Lightroom seeking to solve your problems. As I’ve said before, each of the modules is really a solution. If you’re serious about taming your image collection, learning Lightroom is the best investment of your time. In my opinion, there are no other applications that come close to rivaling the power of Adobe’s photo management software. Lightroom presets are awesome. With just one click, we can apply editing styles to our photos in Lightroom. What’s even better is that we can download and trade presets! 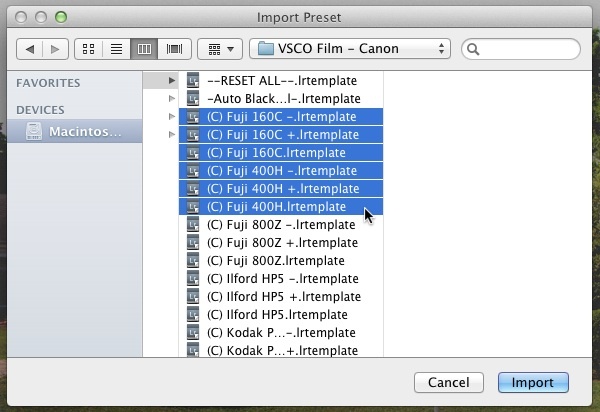 However, we have to import them to get Lightroom to recognize the added presets. Today, I’ll be showing you how. Okay, so now we have our preset ready to import. Go ahead and note what folder that preset is in because we’ll need to browse to it in just a moment. Now in Lightroom, in the Develop module, make sure that on the left panel, you can see the presets already in Lightroom. Place your mouse cursor in the preset area, then right click to bring up a menu. Go ahead and choose “Import”. Okay, so now we will show Lightroom where our presets are. I’m on a Mac, but this is basically the same on the Windows platform. All you have to do is browse to the folder where .lrtemplate files are stored, and then click to import them. 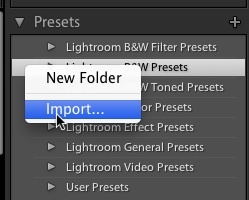 We can also shift click two presets to select a long list of presets, or control click to select multiple presets. 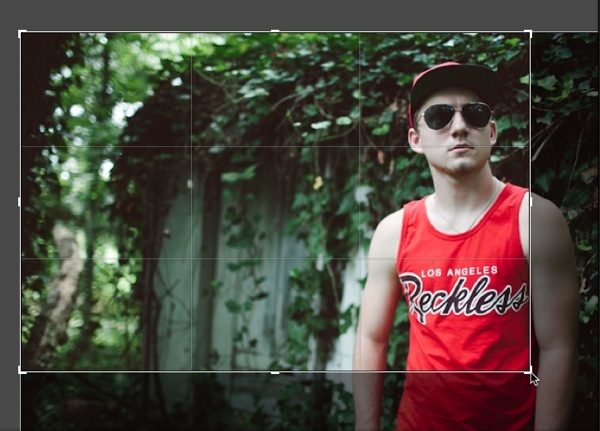 Here, I’m using the VSCO Film Presets, which I highly recommend purchasing. That’s all! Your presets will appear in that panel on the left and you’re free to apply them to your heart’s content. One of the most popular editing effects right now is pushing digital images to look more like film photos. Digital has taken over the world, but film has a “look” that’s just hard to match. I would certainly advocate going out and shooting some rolls of film, but if that’s not a possibility, we can use Lightroom to apply a vintage film effect using the tone curve. The tone curve scares some users away because it’s not like anything that they’ve ever seen before. It’s a graphical representation of the photo, and it’s not necessarily logical. Let’s take a look at how to use it. 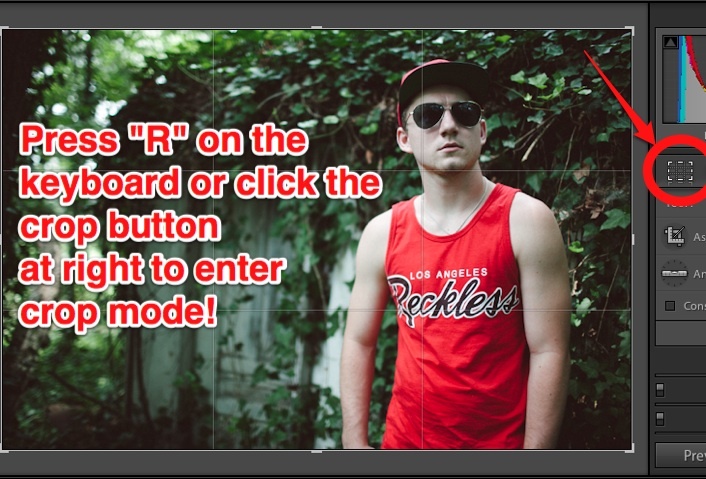 First of all, go ahead and pick an image to work with and enter the Develop module. Now, feel free to apply any other tweaks that you need to – exposure, clarity, temperature, etc. 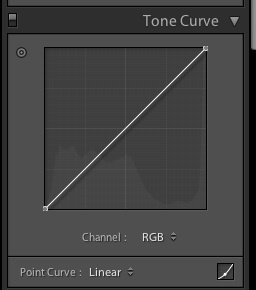 Okay, scroll down the right panel in the Develop module and you’ll come to the Tone Curve. This has the secret sauce for what we want to do. 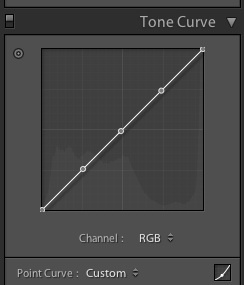 By default, this is how the tone curve will appear. I added 3 points for this effect. Okay, now we’re ready to have fun. Let’s talk a little theory here. Right now, we’re starting with a default tone curve. The point at the lower left hand corner represents the black areas of the photo. The point in the upper right hand corner represents the “whites” of the photo. As we move these points, we’re pushing the blacks to grey, and likewise for the whites. You’ll see what I mean here in a moment. Now, to start playing with the image, I’m going to grab the lower left hand corner point, and start dragging it up. I pull it up until it flattens out. See what happened here? In the upper right corner, you can see how my curves look at this point. Compare this to the earlier image, and you can see that the black areas of the photo are pushed to greys. That’s what playing with the tone curve does! Now, we’ve pushed the white area – represented by the upper right hand point, down to the greys as well by dragging it downward. I really like the effect that this provides. It kind of “mutes” the photo and reduces the contrast, and reminds of the film photos that I grew up around. Of course this can be done with a free lightroom preset as well. Today, we’re tackling collections that are smarter than I am. 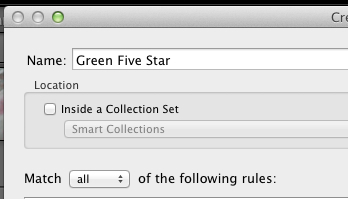 Lightroom’s Smart Collections feature lets us basically create rules for images, and then magically put them together in a set. We can search out 4 star images made with our 50mm lens and put them in a collection. We can search for images shot between 7 and 8pm and instantly have them in a collection. This is one of Lightroom’s most powerful yet complex features. Today, we’ll be learning it one piece at a time. 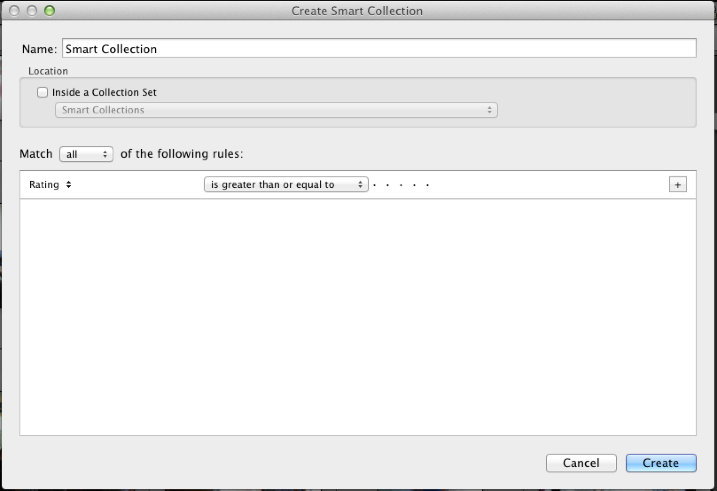 To get started with Smart Collections, make sure that you are working in the Library module. 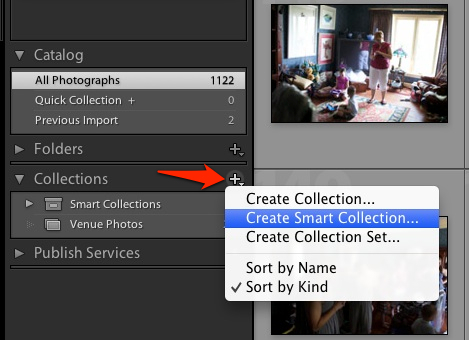 Go ahead and press the plus button next to collections and choose Create Smart Collection to get started. To get started with smart collections, enter the Library module. 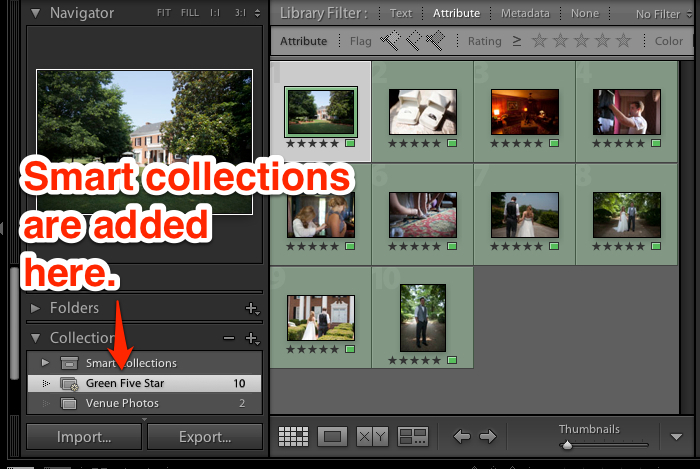 On the left side of Lightroom, press the plus button next to collections and choose New Smart Collection.